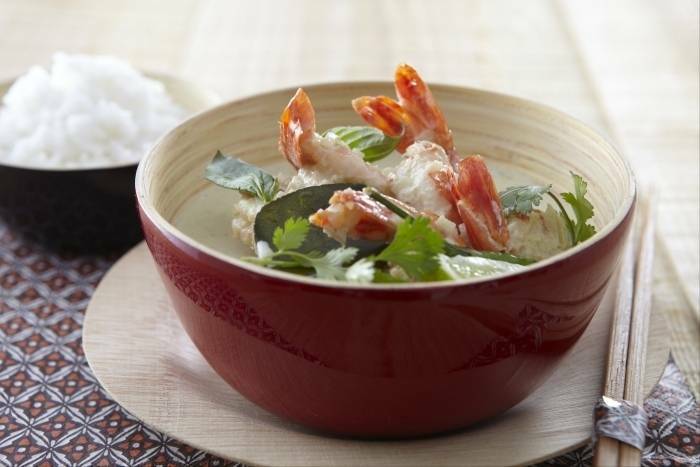 An authentic green Thai curry with king prawns served with jasmine rice. Peel and finely chop the onion, garlic and ginger. Chop the chillies and the lemongrass into small pieces. Zest and juice the limes. Finely slice the green pepper. Pick the leaves from the thai basil and coriander and roughly chop. Keep the stalks from the coriander. Finely slice the spring onions. Place the garlic, ginger, half of the onion and chilli, green pepper, coriander stalks and the lemongrass in a blender. Blitz with the dry spices, shrimp paste and the zest of the lime until you have a rough paste. Add a little coconut milk to help the ingredients blend. De-shell the prawns and remove the digestive tract using the tip of a sharp knife. Heat a wok or saucepan and add a little oil. Fry the remaining onion until soft. Add the green curry mixture and cook for about 3 minutes before adding the coconut milk. Add the prawns and simmer until cooked. Once cooked, add the lime juice, chopped coriander and thai basil. Season with fish sauce and any remaining green chilli if needed. Mix the spring onions through the rice and serve with the curry.